Unfortunately, many of today’s villages have been torn apart. Some parents commute two or three hours a day, others hold two or three jobs outside the home. Some can only be home during weekends. Divorces tear out hearts. Grandparents live miles, even states away. Too many children are in the care of people paid to care; that might be okay if those people care. Not all do. When I grew up in the forties and fifties, I lived in a small town of about 5000 people. I was born during the depression, lived through World War II. I remember blackout curtains and air raid drills. I remember the sirens announcing the end of the war, the horror of the pictures and films of those being released from concentration camps or killed when the A bomb was dropped. I remember crouching under my desk during drills prompted by fears of the cold war and atomic bombs. I knew darn well my desk was not a bomb shelter, but kids have to humor adults in power. Polio fears abounded until Jonas Salk’s vaccine wiped it out. I had the measles, mumps, chicken pox and whooping cough. My life was probably saved by the discovery of penicillin—I spent a year in bed recovering from Rheumatic fever; twenty years on penicillin kept further attacks and heart damage at bay. There were other dangers and problems, but mostly as a child I was unaware of the evils that are part of this world. But in my small home town, I roamed free by the time I was eight or nine, walking to and from school, then taking myself and my dog Lady around to the farms surrounding the town. These were gentlemen farms, mainly used to stable horses. I visited them to feed the horses. The owner of one said never to go in the pasture, her horse would trample me. I suppressed the laugh as his horse, Gerry Jim and I always raced up and down the pasture, his nose on my shoulder. If I tripped, he was more careful than my brothers at not stepping on me. He was lonely and so was I. He gave me strength and I hoped I added pleasure to his life. I wandered free because back then people minded other people’s business particularly when it came to the children of the town. For a period, I thought my mother was a witch because she always seemed to know where I was and what I was doing. She didn’t, of course, know all; but her friends in the village kept their eyes on me and let Mom know where they had seen me and what they had seen me doing. Not so today, although my two sons grew up with pretty much the same freedom because we lived in a small town where they could and did ride their bikes all around. The village was weaker, however, and now is weaker still with the possible exception of small apartment buildings. When we lived in the Bronx, our apartment building was five stories high and each floor had about 10 apartments. Moreover, most of us entered through a common door before dispersing to our homes. We knew each other and for the most part took care of each other. Part of the team was a super and a building manager who both made sure to know everyone and would and did go above and beyond. We also has connections to the local synagogues and had friends in each that could be called on to help in various ways. Moreover, the neighborhood although mixed, was not a hundred per cent safe—there was a murder right around the corner. However, there was still a group of old-time residents, some Irish and some Jewish, who kept an eye on what was happening and would either intervene in some situations or call on the police to settle more serious problems. The local shopkeepers were also watchful eyes. I might not go strolling outside my apartment after midnight, but for the most part I felt safe in this ‘hood’. So relatives, neighbors, shopkeepers formed added circles of care around me both as a child and an adult. Not so much now, for we in an apartment complex that has three stories, but each apartment has its own entrance. After two years of living here, I do know some of my neighbors by but only two by name. I also have gotten to know a few of those with dogs from the surrounding building by name. The building maintenance men serve as a partial watch group, but are not around at night or on weekends. Finally, the closest shops are two blocks away. One of my kids lives in a small town and knows most of the residents. He has driven the school bus during his businesses downtime. The other son lives in more of a development and is more isolated from neighbors. He has a talking relationship with one neighbor and that neighbor is more hostile than caring. I suspect that many of you reading this are in my second son’s situation. In fact this son and his wife asked us to move to Colorado when we retired, so they could have us around to help when they became parents. We were major players in their added care team. The more space between you and the rest of your neighbors, the less they are likely to be part of your added care team and the more important it is to spend some time building one. 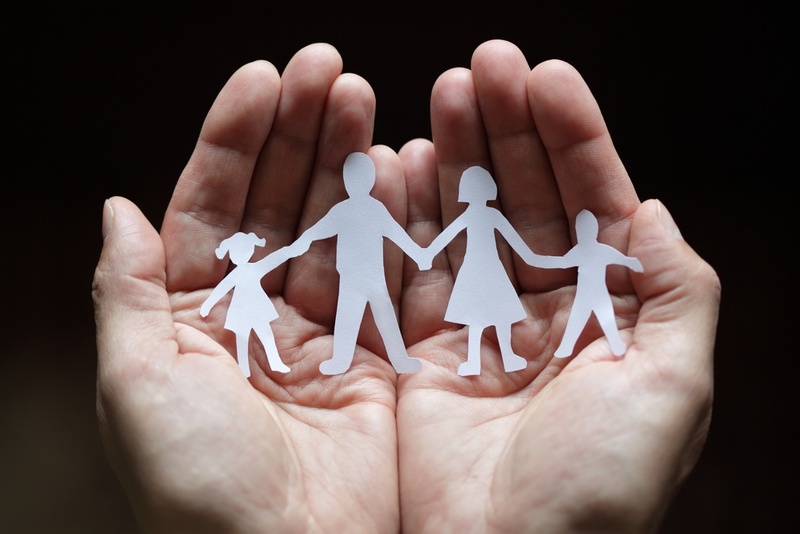 Start by thinking carefully about who involved in your child’s and your life that are helpful. These form part of your Added Care Team. The inner circle dubbed “Angels” maps family members and friends you can call knowing they will help, not just with words, but with actions. One of my Angel Friends got out of bed and drove to the airport to pick up one of my kids when my car refused to start and I had no AAA. Other Angels make dinner when you are sick, take care of your kids when the boss keeps you late, lend you their car, and lend you money. You are lucky if you have two or three among family who you can call Angels. You are even luckier if you have two or three friends that are worthy of being dubbed Angels. Many people have only one or two Angels. And the saddest thing when I directed a crisis teams was to discover those who had none. 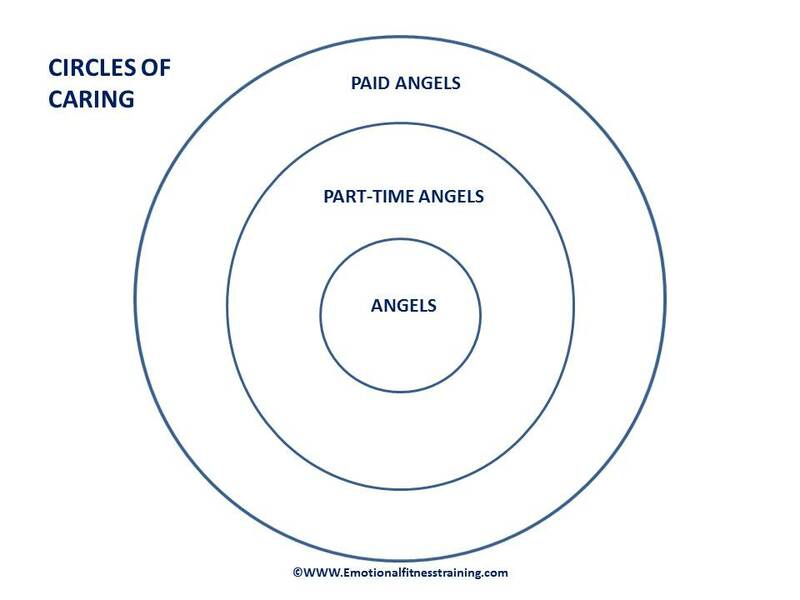 The Part-time Angels are those who will help when they can or help in very specific ways. Some are friends. One of my part time Angels when I was raising my children could be relied on to care for my kids in a pinch, but would never lend her car. Another could always cheer me up, but never gave any concrete help. Some Part-time Angels are paid to do a job, do it well, but will go above and beyond when you are in need. I think of a gas station attendant back in the days when we didn’t have to pump our own. A tire blew out on my car and he saw me standing by the side of the road, pulled over, changed the tire and would not take anything but a “Thank you.” I think of the super in our Bronx apartment building, the shop keepers in that ‘hood’ who would often go above and beyond. The final circle, dubbed Paid Angels, are those whose job is to care and to be there to help during their working hours. Doctors, lawyers, caseworkers, nurses, nurses aides, teachers, child care workers, some coaches. Not all belong in your circle of care; some just do a job; the ones who really care, who treat you and yours like people and not patients or clients are the ones who belong here. Mind your manners when dealing with any of your angels. The ones on your Added Care Team are people and they need to hear “Thank You” and “Please” and “May I” just as much as the rest of us do. They also need quid pro quos—their back scratched because they scratch yours. Moreover you can’t abuse them. If they care for your kids when you are sick, the favor must be returned. If they lend you money, you better darn well better pay it back and soon. For those paid Angels that go above and beyond, a Thank you note with a cc to their boss is in order. In today’s electronic world, such notes are very easy to send and worth their weight in gratitude. This DAILY PROMPT: Mentor Me – Have you ever had a mentor? What was the greatest lesson you learned from him or her? I think I was lucky in having parents who taught me well and their best lesson was that you always had a choice to be kind or cruel and that the wisest choice was always kindness. This entry was posted in Parenting Issues and tagged Added Care, adoptive parents, Emotional fitness, Fitness, foster parents, Getting the help you need, Mentors, parenting, postaday, Self-care, teens. Bookmark the permalink.